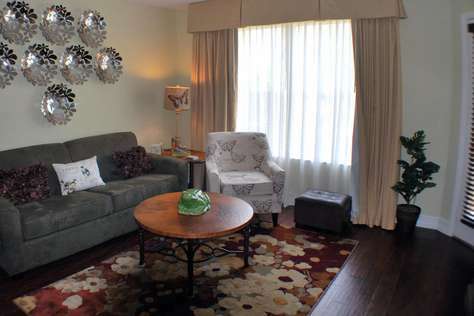 This beautiful 1 bedroom / 1 bath condo is a garden oasis, located in the middle of the Orlando Attraction area. 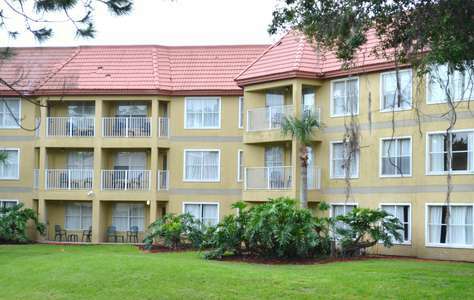 Situated in South International Drive, it just minutes away from SeaWorld, Discovery Cove, Aquatica and the Orlando Convention Center. Property was excellent for our party of 2. Way better value than the hotels in the area. Very clean when we arrived. Has necessities ready to go: tp, kleenex, soaps, shampoos, paper towels, trash bags, kitchen tools and dinnerware, etc. Plenty of towels. Good ones, not rough ones. Even has beach towels, which came in handy when we drove to the Melbourne area beaches (less than 1 hour). Full size fridge, good size microwave, and a toaster oven, which worked great for cooking our favorites chicken dishes and blackened salmon. King bed very comfy. Bathroom was good for our needs. Good water pressure in shower and good flushing power. Nice sitting area for TV, etc. About 60+ cable channels, incl. HBO. Dining area for 4. Nothing looked dated. All furnishings in great condition, not worn. Great location. Near everything, including I4 and the 528 if you're venturing out like we did every day. And it's far enough back from International Drive that's it's quiet and secluded with plenty of trees and foliage. Pool & hot tub were great. Always very clean. Just a great experience! Would definitely stay here again. And would definitely recommend. Beautiful, clean very comfortable and quiet. The booking and entry process was so easy and stress free. We highly enjoyed our stay and will definitely stay here again. We were surprised by a beautiful goodie basket and a few other very thoughtful details. It has been about a month since I have stayed at Parc Corniche but I wanted to take a moment and write the staff and unit a well deserved review. 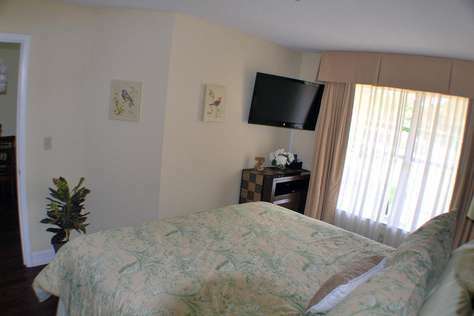 The room was very clean and accommodating as it included everything one would need for both temporary living and vacationing. The staff was excellent and supportive as they were willing to go above and beyond to help with my stressful moving process. They even allowed me to extend and reserve the room multiple times while searching for apartments. 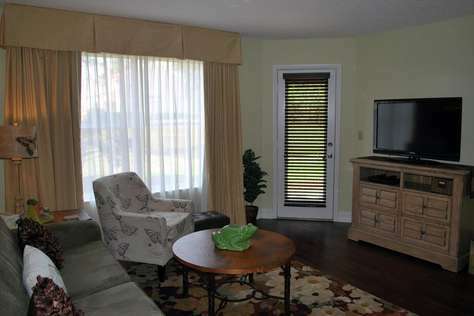 In closing, I would definitely recommend staying at this condominium as I had nothing short of a fantastic experience! This was the second time we've stayed at this lovely condo, and plan to stay again! It's location is central to all we need when we visit family in the area. The manager is quick to reply and so accommodating! We especially loved the quiet location and beautiful pool! I stayed at Parc Corniche for ten days while vacationing with my mom who was visiting from Europe. The unit was very clean and comfortable with a lovely clean pool outside, which unfortunately we didnt have time to enjoy much. The booking and check in process was so smooth and seamless thanks to the property management, and the price was very reasonable. When we arrived we were pleasantly suprised to see a bottle of wine and a selection of soft drinks all complimentary. Thank you ITZ Vacations for a wonderful stay, l wouldn't hesitate to stay here again! We viewed various properties, prior to choosing this condo and based on price, availability and positive reviews, this fit the bill. The booking process was extremely smooth and we received all of the details around a week prior to our arrival. We arrived after check-in time and as soon as we walked in the door, we knew we made the right choice in rooms. The interior was updated and immaculate. The AC was on, so the room was very comfortable. To top it off, there was a sweet welcome basket filled with treats for the kids and a bottle of wine for the adults, which was a nice touch. During our stay, we had no problems with the apartment. They trash dropoff was right next to the building, the coin operated laundry is right upstairs and the lobby provides rolls of quarters. 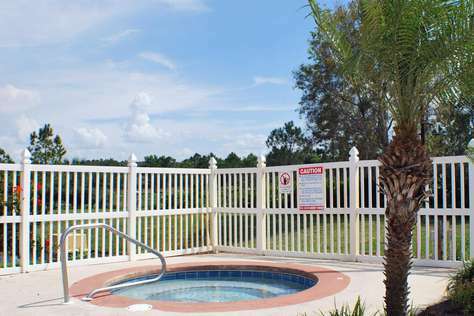 Being that we were spending our time at the parks, we didn't really take advantage of the pool, but we did see it and it looked well maintained as did some of the other amenities that the property offers. Just a quick heads up on the sofa bed. Its inflatable! While ITZ has a binder full of useful tips about the condo and the area, I missed that at first and thought it was just an uncomfortable couch bed, but I was wrong (my fault!). There is a pump in the living room drawer and the port is on the couch! Overall the stay was great, the condo exceeded our expectations and when we come back to the Orlando area, this will be our first choice of places to stay. Every single bit of information on this property was accurate! We were minutes away from Sea World, Disney World and many wonderful restaurants. All employees of the property were very friendly and helpful. I would recommend this property to anyone and I will definitely book with them when we return to Orlando! What a great one bedroom condo! It was clean, cozy, and close to all the area attractions. We would defiantly rent it again. This unit was just as described on the vrbo website. We have always had good luck renting thru vrbo and we were very satisfied with the cleanliness of the unit and all basic necessities were provided. It only took us about 20 minutes to get to the Disney World park complex and there were plenty of grocery stores, restaurants, drug stores, etc. within a five minute drive. We will definitely bookmark this rental number if we visit the Orlando area again. The king bed was very comfortable. The unit was also very quiet while we were there. This unit worked very well for us, and quite a bargain as well. The bed was comfortable, the kitchen was well stocked, and the location is very good. We would book it again. It was perfect for me. clean, comfy, spacious, welcome basket. My daughter had the bed. I actually picked the sofa which was air mattress and softer I thought. at night the pool was great. Quiet, I would book again if I was in the area. 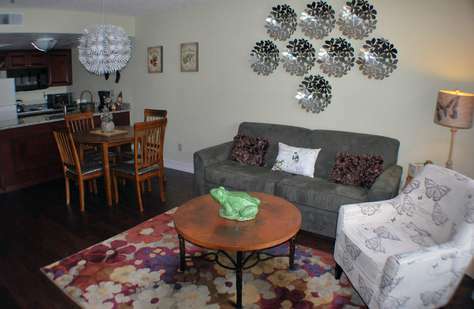 This is a small little condo unit that can sufficiently suit up to 4 people. I received a welcome basket with snacks, and a bottle of white wine. In the fridge, It has 4 soda cans and 2 small, good quality water bottles. After arriving to the unit late at night with no time for shopping, this was such a pleasant welcome! 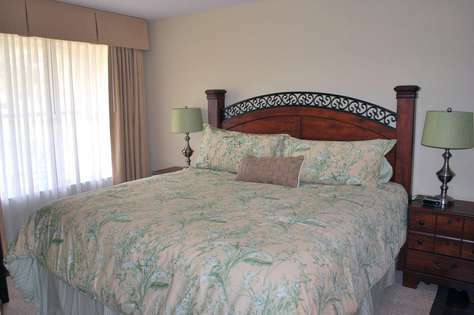 The unit is fully furnished, and the King bed was very comfortable. The ITZ Properties staff was so friendly and accomodating. 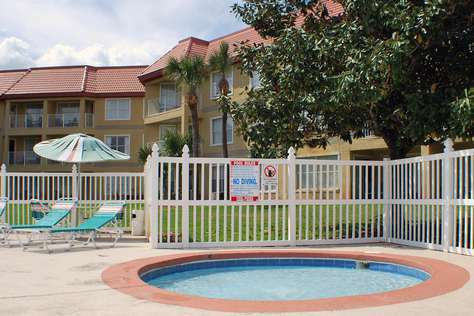 The location is great for those that look to go to the Sea World, which is 5 minutes away. Disney World is only 10 minutes away. It is a good location to all the tourist attractions, shops, restaurants, and big supermarket Publix. Costco is only 10 minutes drive away. The rate is a great value and less expensive than renting it directly through Parc Corniche. Condo was wonderful. Amenities were great. Even had a welcoming basket which was a nice touch. 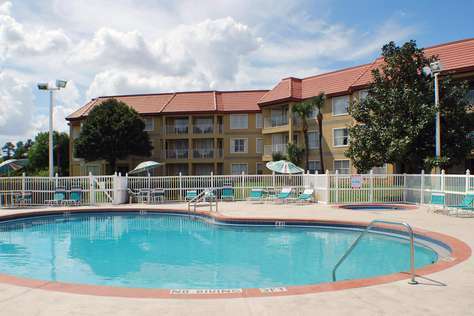 Location is convenient to Universal Studios, Disney and ESPN Wild World of Sports as well as many restuarants. This unit is exactly as shown. I was in Orlando for the weekend for a conference at the Orange County Convention Center. This was a great option as opposed to the cost of a hotel room at the center. This unit is not far from there and is an easy drive. We also went to Epcot one day and the drive over was not far and easy to get to. I would recommend this unit to a couple or someone who is needing a stay outside of the normal hotel fare. I was fortunate to stay here for 11 nights. Everything was as stated and more. 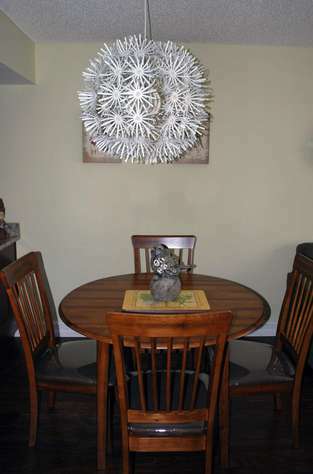 The condo was clean, attractively decorated, and comfortable. The first floor location was easy to move into, and the patio was nice with a view of a small pond. The bed was very comfy, and the bathroom was nice with the dual entrances. 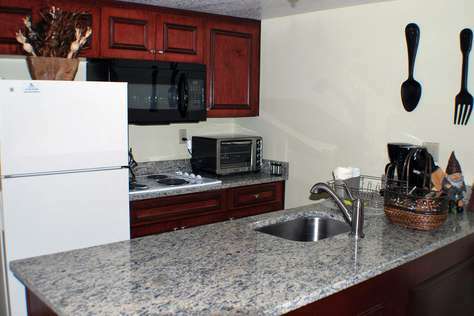 The location was convenient to all attractions, groceries, shopping, restaurants, etc. The kitchen was well stocked with everything you would need or want. The Welcome Basket was a very nice touch and appreciated. I feel very fortunate to have found such a wonderful place to call home for my vacation. I hope to stay here again in the future. My husband and I thoroughly enjoyed our stay! It was clean, comfortable and convenient. We went to Disney World for a few days - which is about a 15 minute drive from the condo. It was perfect for us to make/pack dinner and lunches at the condo and bring them to Disney World. It saved us a lot of money! The kitchen was stocked with dishes/utensils/etc...which made things very convenient for us! I think they literally thought of everything to make our stay perfect! I totally recommend this place! Close to airport(15mins), Disney(15mins), and groceries. Good value and interior was nicely redone. The condo was everything we needed and more. Great décor and the starter supplies provided were much appreciated. Saved us from running out to the store when we arrived. Furniture and bedding very comfortable, just like home! We could not have asked for anything better! Customer service was also fantastic. Would definitely book this condo again! This was a great location, and a great place to stay while visiting the area. It was such a nice touch to be able to cook our own meals and not have to spend money going out to eat all the time. 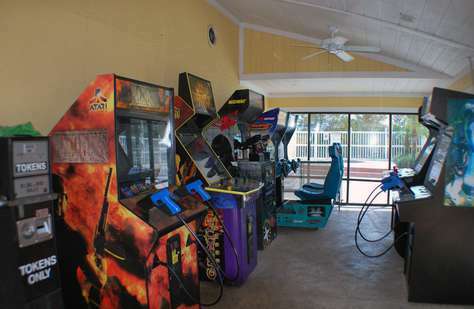 The location is perfect ad centrally located just off of I-Drive near seaworld and plenty or restaurants and things to do, and just a short drive to Universal Studios and Disney world. The condo itself was well furnished with everything we could thing of, including paper towels, garbage bags, toilet paper, etc. It was in a quiet location and had a nice little lake in the backyard right off of the back patio. The rental process was seamless and the property management was great. There is a gym, pool, and jacuzzi on the premises. The only one complaint that I have is that we encountered a few roaches on several occasions. Once in the bathroom and a couple in the entry way to the condo. Other than that, I would definitely reccomend this condo and would stay here again. Thanks for a great stay! This was the perfiect place for the two of us. The kitchen was perfect for cooking with all the necessities from the pots, pans, dishes, glasses even down to dish soap and sponge there was no need to worry about the little items. 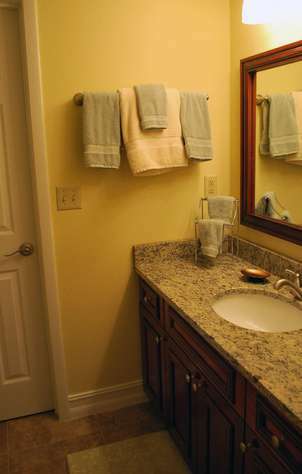 The bathroom was spacious and nicely layed out with plenty of towels. 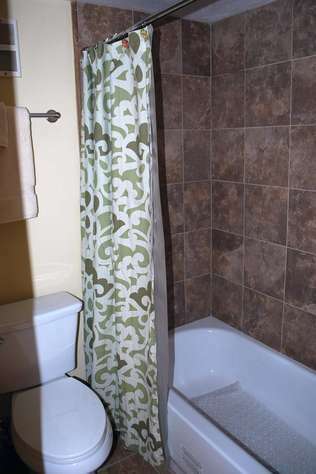 The condo was very updated and modernized just as the description and pictures show. This was definatly more comfortable than staying in a hotel. It was a nice home away from home close to all the attractions but away form busy downtown. The attention to detail was awsome even down to the gift basket and bottle of wine. Many thanks for a comfortable stay.